EXCAVATORS 42 E&MJ • NOVEMBER 2017 www.e-mj.com rent compact bucket-wheel excavators from working successfully in materials with a UCS of up to 20 MPa to as much as 40 MPa, with the equipment designed to work in materials such as coal, limestone, phosphate rock and potash as well as hard overburden. 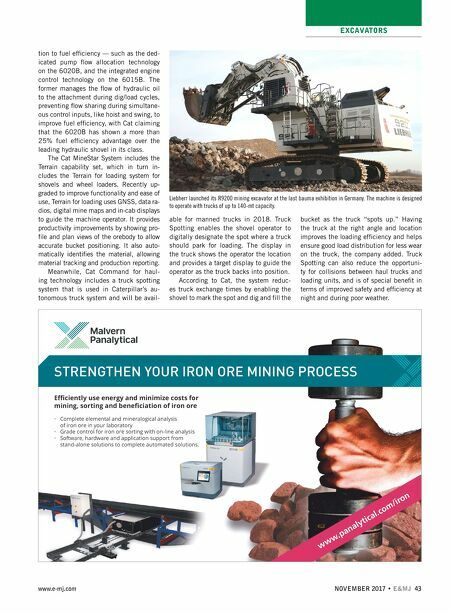 With a redesigned bucket wheel, the Barracuda enables a compact bucket-wheel machine to cut as well as to dig, the com- pany said, describing it as a mass-cutting, high-throughput machine for harder materi- als. It can also help eliminate the need for drilling and blasting, with resulting environ- mental and economic benefits. Able to operate with bench heights from 3.5 m (11 ft. 6 in.) to 7 m (23 ft.), the Barracuda can be operated in any of four different configurations: as a stand-alone mining machine that dumps cut materi- al behind it for subsequent loading using wheel loaders; direct-loading into haul trucks; fully continuous using a bench con- veyor; or as a high-capacity miner linked to an integrated overburden-handling sys- tem. Using the equipment to load haulers directly involves the addition of an inter- mediate hopper, which acts as a buffer to allow the Barracuda to cut continuously. To provide a bucket-wheel with great- er "bite," thyssenkrupp has redesigned it with higher input power, a stronger struc- ture, more buckets and more teeth. A key research concept was to identify the cut- ting configuration with the lowest energy requirement, which led to setting a maxi- mum cutting depth per pass of 100-200 mm. A typical Barracuda wheel could be fitted with as many as 60 cutting blades and more than 500 individual teeth, with the option of changing the wheel fitments to conventional buckets if the cutting con- ditions within a deposit are variable. In May, the company announced the sale of its first Barracuda system to the China Huaneng Group for use at its Yimin- he open-pit coal mine in Inner Mongolia. Scheduled for commissioning next year, the 6,700 lcm/h machine is part of an in- tegrated system that also includes a belt wagon, a conveyor system and a spreader. It will be used to mine both overburden and coal, while helping to reduce operating costs and mining-related CO 2 emissions. Cat Focuses on Operator Assistance With both rope shovels and hydraulic exca- vators in its surface-mining portfolio, Cat- erpillar is pushing ahead with systems that will make them more productive. Its most recently introduced shovel technology is Op- erator Assist — Enhanced Motion Control, which protects the machine from making movements that could cause damage or un- due wear — without sacrificing production. The company is also developing additional software as building blocks for the semi-au- tonomous operation of electric rope shovels. Caterpillar has developed the Latch- Free Dipper for its 7495 shovel, helping to eliminate what the company stated as being the biggest cause of rope shovel downtime. The components are designed and tested for a service interval of 3,000 hours, rather than the daily maintenance that is often currently needed. For its hydraulic excavators, Cat told E&MJ that some of the most significant recent design advances have come in rela- TAILINGS FLOTATION CELLS THICKENER UNDERFLOW CONCENTRATORS CENTRIFUGE AND CYCLONE FEED Series 5200 Control Pinch Valve Series D Slurry Knife Gate Valve Series DX Slurry Knife Gate Valve Series 75 Manual Pinch Valve Red Valve www.redvalve.com | 412.279.0044 The Best Choice for the Toughest Mining Applications. 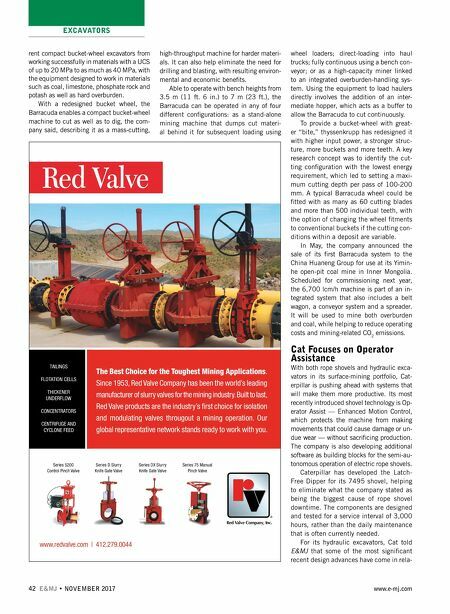 Since 1953, Red Valve Company has been the world's leading manufacturer of slurry valves for the mining industry. Built to last, Red Valve products are the industry's first choice for isolation and modulating valves througout a mining operation. Our global representative network stands ready to work with you.